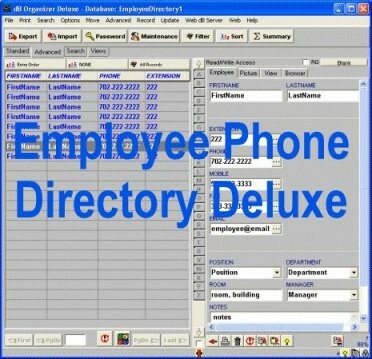 Employee Phone Directory Deluxe for Windows: easy-to-use database management software that helps you to organize and manage your employee phone directories. Includes 3 employee databases to choose from. Fast and easy employee data entry. Print employee directories, employee phone lists, employee email lists. Search employee database by any field, sort records by any database field. Evaluate employee performance in Excel. Employee Project Clock is a employee time recording program.